HBI’s product experts were consulted several years ago to create cantilever shelving solutions for multiple branches of a large Alberta Library. The shelving was chosen in part for it’s ability to adapt to changing needs in the community. So when the time came to modernize for functionality with a warm and modern aesthetic, the Library’s leadership team started to look at options for adapting what they already had. After all, if there’s one thing libraries are great at… it’s getting creative! In consultation with library staff, HBI’s Product Experts began the collaborative process of modernizing a City’s worth of shelving. Lots of options were considered and ultimately, HBI supplied several standard and custom components. Some branches added wood tops to low shelving and all branches began modernizing end panels with custom graphics. HBI also began working on an innovative design for lighted shelves that started with a review of traditional options. After years of product development, many branches implemented a single low-profile light at the top of a stack. This design was an improvement on others because it was small, inexpensive, and hard to damage. The effect was immediate – Warm! Welcoming! Accessible! Still, HBI and the public library saw room to further improve this design. After more development, HBI began distributing an exclusive plug-and-play LED system that integrates into every single shelf. 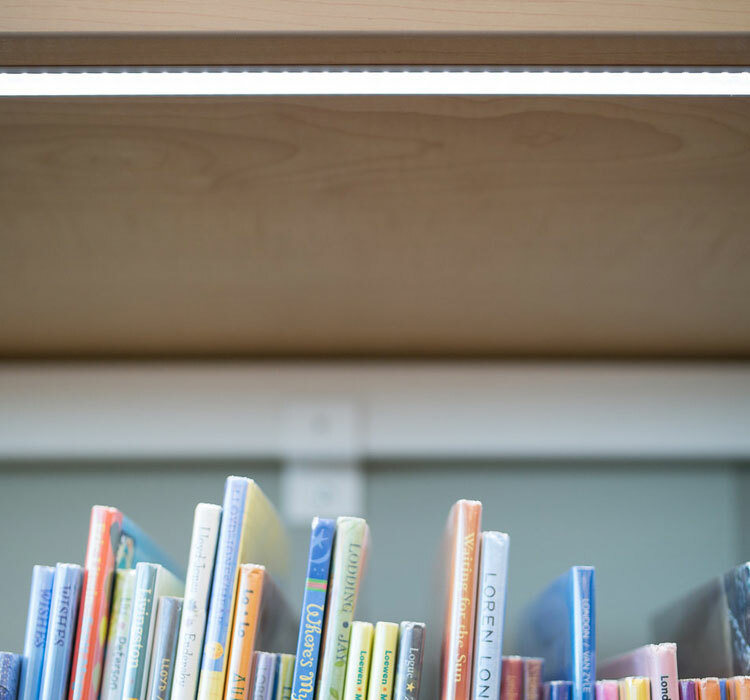 There’s no risk of harm to patrons from misuse, it’s easy for any staff members to reconfigure shelves themselves, and most of all – it’s half the price of other lighting options for library stacks. This design (called RLS) couldn’t stay secret for long. It was quickly implemented at Mount Royal University’s Riddell Library and the New Calgary Central Library! Now, patrons experience the effect immediately upon entering a branch: “You are welcome here!”.